International trade can make a huge difference towards sustainability, as over half of what is produced globally crosses national borders. Several of the United Nations 2030 Sustainable Development Goals – such as realizing ‘zero hunger’ and ‘no poverty’, ensuring all have ‘decent work’, and taking ‘climate action’ – crucially depend on transforming the way international trade is organized. But international value chains are complicated, involving many different people working in diverse contexts that change over time. Therefore, various players – businesses, governments, NGOs, farmers, unions, and trade associations – must work together in coalitions and they must design innovations within and across several domains, such as technology, policy, and economics, simultaneously. And they must bounce back from setbacks and persist in their efforts over time. Transitioning to sustainability in international trade has all the traits of a ‘wicked problem’: everyone involved recognizes that change is needed, but no single entity acting on its own can make it happen. Common solutions may have little effect, and they can even slow down any real progress. IDH, The Sustainable Trade Initiative is an international organization that convenes, finances and manages large programs to accelerate transitions toward sustainability together with multinational and smaller companies, governments and civil society. Working with a wide variety of partners over the last 10 years has taught them the value of ‘clumsy solutions’, which take shape incrementally as those involved learn, and tinker, and learn more again. This process of collective exploration, while imperfect, is most powerful when dealing with complexity. Clumsy solutions are difficult to pin down, especially considering that much of the knowledge used by the various people involved is tacit. I joined IDH in studying the successes of their past endeavors, using an approach inspired by action research and grounded theory. We found that there is an art to transitioning toward sustainability, something that can be learned and practiced and improved. We have identified 5 key dimensions that are essential for the success of sustainability collaborations: relational, discursive, institutional, reflective, and implementing. 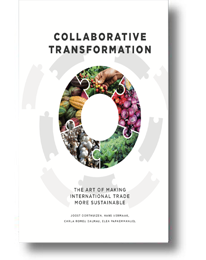 We have tried to describe these dimensions and how collaborations can attend to them simultaneously, weaving distinct efforts together to create powerful change. Each dimension is also illustrated with case examples ranging from cocoa to cotton and tea to palm oil. The examples we present in the pages that follow make clear that there is no simple succession of steps to follow; instead, stakeholders succeed when they attend to all of these dimensions simultaneously. Stakeholders’ efforts in these 5 dimensions must be intrinsically interwoven, catalyzing each other, building on one another. The book was presented on the occasion of IDH’s ten year’s existence on November 15th, 2018. It is offered as another step in forging a common language and understanding amongst partners, one that may enable us to multiply the magic of collaborative transformation, and thereby positively shape our collective future. PS1: See more on IDH here. PS2: A more personal story about the ideas behind IDH’s work is available in a podcast interview with its founder: click here.